Between 35 and 65 m2, our 21 suites and rooms are spacious, cosy, refined and open to nature. Furnishing and decoration have been carefully selected to stimulate the senses and stir up emotions. In a spirit of aesthetic mixing and openness to the world, the furniture attests the delicate harmony between history and modernity, with its elegant mid century modern furnitures, or contemporary creations and artworks from our collection. Most of the rooms and all the suites have a private and wooded terrace to relax in privacy. Both intimate and spacious rooms, you will love their warm and cosy atmosphere. Located upstairs and overlooking the estate, Deluxe rooms offer a vast area and beautiful views of olive tree fields, the village square or the Crau Plain. XXL size for these rooms opening to private terraces. Ideal for outdoor well-being sessions in front of the preserved nature. East-facing, all of them provide intimate and lovely terraces. Deluxe suites are ideal for families, a preserved space to enjoy together. The excellence and pleasure of vast dimensions duplexes. These independent, elegant and sunny suites offer a lounge area and an office space. 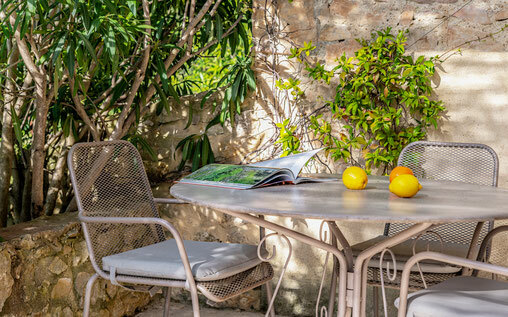 Spectacular, our signature suites are a must in the Alpilles. The delicacy of their layout, their exteriors an invitation to relaxation and tranquility.